Finally an industrial thermal camera with high temperature calibration at an affordable price. 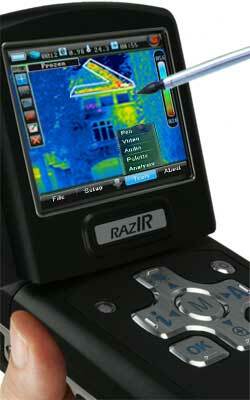 The RAZ-IR NANO industrial thermal camera is the ultimate combination of durability and ease of use. Now comes with high temperature measurement function for the most demanding applications. Now you can afford a high temperature infrared camera with the RAZ-IR NANO HT. The RAZ-IR NANO-HT high temperature industrial thermal cameras come loaded with the same features as the standard high end NANO thermal imagers. But with the HT you can now measure temperatures up to a whopping 1,200° C! That’s the same as measuring up to 2,192° F! That is HOT. Normally, this high temperature measurement is only found on high end ultra expensive thermal imagers. The NANO is the first Low Cost Infrared Cameras with high performance temperature measurement features. You still get all the legendary NANO features like tactile touch screen displays, easy onscreen menus, thermal auto-focus, live thermal video recording (real time) and advanced thermal analysis software. The NANO infrared camera is one of the most advanced thermal imaging systems available today at any price and now with High Temp features it is impossible to beat. Now you can have the latest high temperature technology and still see a rapid return on your investment. The RAZ-IR NANO is here and now high temp thermal infrared imaging is within your grasp. The modern touch screen with simple intuitive menu controls, makes navigation a breeze. Infrared remote control comes in handy in those tight spots or for demonstration purposes. 60Hz integrated digital real-time thermal video imaging offers endless possibilities. Picture-in-picture overlay of thermal image and matching CMOS digital visual image. Automatic thermal image focus makes it easy to capture the perfect image the first time. Modern flip up screen makes it easy to point and shoot images from any angle. 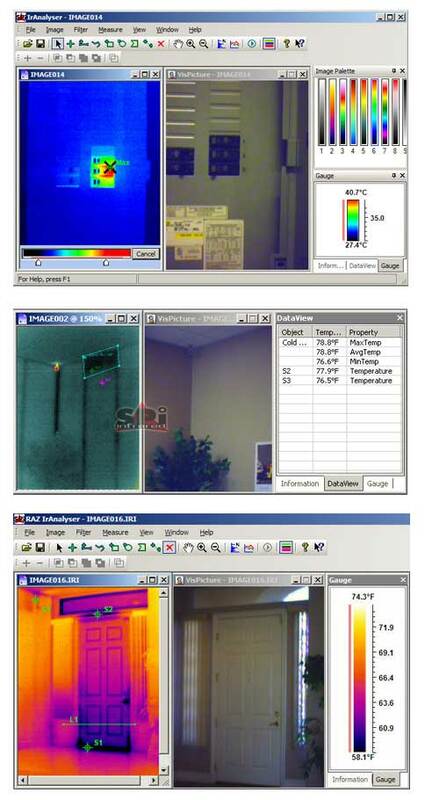 LOW COST INFRARED CAMERAS THAT MEASURE HIGH TEMPERATURE. NOW AVAILABLE WITH THE RAZ-IR NANO-HT. The RAZ-IR NANO-HT industrial thermal camera is equipped with an ultra bright LCD with precision touch screen interface. The touch screen on an infrared camera allows the operator a much greater degree of control over image analysis and menu functions. In addition, it is a much more intuitive interface than traditional button and menu designs. However, the Nano is all about choice. Every function on the infrared camera is available from a variety of inputs including the razor sharp LCD touch screen, on screen menus and dedicated button controls on the camera. The NANO-HT is ready to work however you want to work. 60Hz intergrated digital High temperature thermal imaging in real-time expands your possibilities. Why would you settle for anything else? 7Hz, 9Hz, 20Hz are you joking? Life happens in real time and your thermal camera needs to capture those events as they happen. Ever wonder why your expensive thermal camera cannot record video as well as a cheap camcorder? So did we! REAL TIME IS THE KEY. With the NANO-HT industrial thermal camera, you can record High Temperature thermal video. You can also record thermal video directly to a PC via USB 2.0. Now you can easily record thermal video and deliver that extra something to in your analysis reports for your clients- giving you a true competitive advantage. NO MORE BLURRY IMAGES! 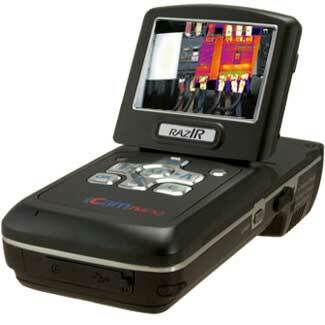 The RAZ-IR NANO-HT industrial thermal camera has an integrated infrared remote control panel. This unique feature lets you use the NANO-HT infrared camera in a variety of applications that are difficult if not impossible with other cameras. You can easily control all the functions of the infrared camera from a safe distance completely wirelessly with the infrared remote control. The RAZ-IR NANO-HT gives you HIGH TEMP picture-in-picture fusion capability. With the NANO-HT you can now integrate the thermal image profile directly on top of the regular image. You can even adjust how much of the each image is visible. The NANO-HT is specially calibrated for precise fused registration of both types of images offering you unparalleled clarity. This advanced, thermal PIP technology gives you a while new way to look at problems and to find the best solution. The standard in thermal optics is auto focus for your thermal imager. All the $50 digital cameras have auto focus so why is it that most infrared cameras don’t? We don’t know either but we do know that the RAZ-IR NANO-HT comes with a built in auto focus. With the RAZ-IR NANO-HT you give up nothing and get everything. The high temperature calibration infrared camera incorporates an articulated LCD viewing screen for imaging in the position most comfortable for you. The RAZ-IR NANO-HT gives you the choice to work the way you want. The RAZ-IR NANO utilizes radiometric temperature measurement, so in addition to seeing what is hot and cold, it also records the temperature of any particular point in a scene. Simply line up the crosshairs on the spot that you want to analyze, and the NANO does the rest– in real time. Take your measurements and move the crosshairs to your next area of interest. The RAZ-IR NANO allows emissivity, ambient temperature, object distance, and humidity adjustments for temperature calibration and even greater data accuracy. Once a problem area is identified, the push of just one button saves the image. Later, download all saved images into the Analyzer software (included with every NANO camera) and explore a whole world of analysis options. Every pixel within every image is fully calibrated and contains radiometric temperature data. The Analyzer software has complex temperature measurement functions like multiple spot, bounding box, min/max/average, histogram, and delta T that provides content for comprehensive and professional looking thermographic reports. Voice annotation lets you record voice comments in the field and attach them to a thermal and visual image. Now you can keep all your notes organized for later report generation. This model is a new addition to the product family. This means you get the most up to date technology, securing your investment for years to come. 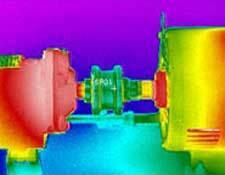 HIGH TEMPERATURE INFRARED CAMERAS ANALYSIS. MEASURE TEMPERATURE UP TO 1,200° C (2,192° F)! Industry standard consumer JPEG image storage format. No proprietary software needed to view and transfer thermal images to your PC. Fusion Technology overlays the thermal image onto the corresponding 2 megapixel CMOS visible image for sensor fusion. Control the amount of blend to best highlight the target area. The world wide choice of thermography professionals. Now shipping to destinations around the world. Our export team can assist you with international shipments. The RAZ-IR Nano-HT infrared cameras are available with the same lens options as the standard NANO. The long range telephoto lens lets you analyze High Temperature scenes from a safe distance for careful analysis. The wide angle lens gives you room to maneuver in tight places. The NANO-HT covers all your options. The tactile touch screen technology on the RAZ-IR NANO-HT puts high temperature infrared analysis capabilities right at your fingertips, old fashioned button technology is just that, OLD. Not only can you draw standard boxes and circles for high temp measurement, the NANO touch pen lets you trace any irregular outline on the LCD for analysis. This smart design makes it easy to get the best high temperature accurate measurements.